The SEGA danglehead processor at work in timber harvest area #2, just west of Galena. Photo courtesy KIYU radio, Galena. 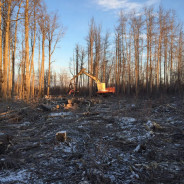 Sustainable Energy for Galena Alaska hired three equipment operators last week, and the crew went right to work on the land permitted for timber harvest by Gana-A’Yoo Limited – the village corporation for Galena, Kaltag, Nulato and Koyukuk. The final timber sale agreement with Gana-A’Yoo was only finished a few weeks ago, due to legal questions about liability. SEGA General Manager Tim Kalke says it’s great to finally get into the woods, after so much work behind a desk to prepare for the timber harvest operations. But managers and crew alike are trying to proceed cautiously. The harvest is beginning in cottonwood-dominated forest west of the Galena airport, but SEGA will also deal with spruce and birch when they can. Trees are cut down, limbed, bucked into large sections, and then stacked in small groups. 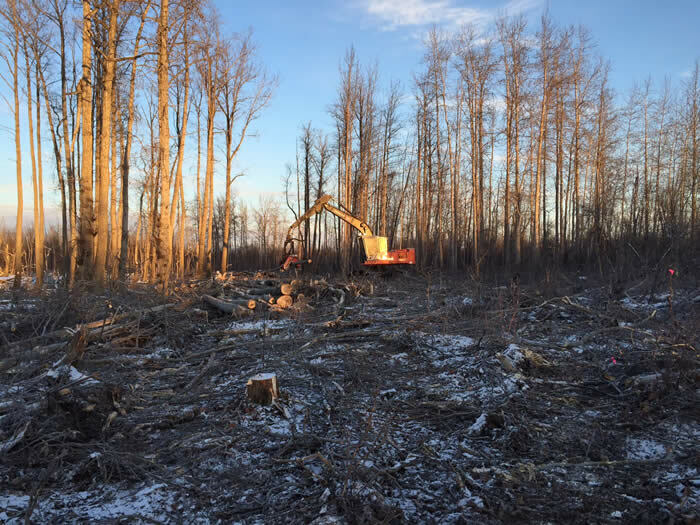 Later this winter when the ground is completely frozen, a log truck will retrieve the wood and bring it to a processing area on base, where logs will be turned into chips. Ten harvest areas have been mapped out, with a dozer trail leading to each one. These harvest areas might yield only about half of what SEGA originally estimated that they would, but Kalke says it’s a good first step. SEGA is harvesting trees between 2 and 14 inches in diameter, according to Kalke, because that is the range that the chipper will handle. Smaller materials like the tops and branches are likely to bind up the chipper or sneak through in large sections, causing problems with the chip handling system that will move chips from storage to the boiler. 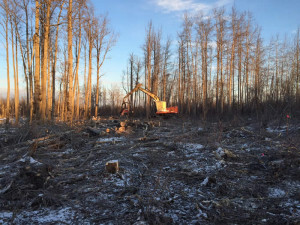 Other purposes for the wood that SEGA is harvesting might include commercial firewood sales, and value-added products like wood trim. SEGA is hoping to have wood chips ready to go into a new wood-based heating system on base by this time next year.